An interesting piece on the Constitution negotiations has gone up on the European Voice website (subscription only). It reports that the UK is becoming "the most difficult member state" in the talks. Apparently the Government is opposing the creation of a "legal personality" for the EU - which is being made a "red line" issue by the Germans. As has already been reported the UK is also opposed to the Charter having legal force, to giving up more national vetoes and to collapsing the pillar structure (which would hugely increase the power of ECJ judges and the Commission). What is interesting is that apparently the French are saying that in return for the Charter's omission, and the deletion of EU symbols from the text- such as the flag and the anthem - the UK needs to give way on majority voting. A spokesman for Sarkozy said, “Blair can be bold on qualified majority if there is nothing on the charter and the Union’s symbols”. We doubt that the UK Government will sign up to anything that abolishes more national vetoes. But one thing is certain; they won't get their way without a fight. Time after time in EU negotiations Blair showed he wasn't up to it; can Brown deliver where Blair failed? Housing Minister Yvette Cooper has not had the best of weeks. Home Information Packs, the measure which she had personaly championed - and threatened to resign over - were watered down and delayed for the second time this week after a legal challenge by industry groups. So she can't have been too happy that her Shadow - Michael Gove - today forced her to admit that the Government has already wasted nearly a million quid promoting the things. It seems that some Conservative MEPs were pretty unhappy to be told by their whips that they had to support the 1960s-style price caps put on roaming charges in the vote in Strasbourg on Wednesday. "Like many national parliaments, the European Parliament has rules that members may not vote on matters where they have a pecuniary personal interest. This is intended to stop, for instance, members who hold shares in a company that might be affected by a decision from benefitting from the way they vote. In yesterday’s vote on capping mobile phone charges, two of the Eurosceptic Tory MEPs got up to say that they would not be voting because they stood to gain financially if phone charges went down, because they owned mobile phones." Jonathan Freedland has an interesting piece in the New Statesman on Brown's foreign policy. All very well - but does Brown really have the guts to crash the talks? In one sense it wouldn't be too hard. The Czechs and Poles are having constant high level President-to-President dinners, and seem to be more serious about the voting weights issue than a lot of people realise. However, without some kind of big country ally, both will probably fold in return for concessions. Blair will leave them to twist in the wind, but there is certainly an opportunity for Brown to hold up the talks... if it's not too late when he takes over. Still, it seems more likely that Brown wil go with Plan "A" - sign up to a mini-constitution then downplay it. He isn't a eurosceptic - though he is less keen to make political sacrifices for Europe than Blair was. Where Brown would like to set a lead, rather than just react, is on the aid and trade agenda he has made his own (his only beef with the Make Poverty History campaign is that he thinks it should be pushing governments, including his, harder), and also on climate change. He wants to outmanoeuvre the Tories on this territory not by matching David Cameron wind turbine for wind turbine, but by coming up with the kind of large-scale breakthrough that would make Cameron look like a lightweight. He speaks of plans for the reforestation of the Congo, of recasting the beleaguered World Bank as a new Environment Bank, of establishing a carbon market in London. This is the level he wants to operate on; he'll leave the organic broccoli to Cameron. Also interesting - but how is he going to get a "real breakthrough" on trade without some kind of fight in Europe? 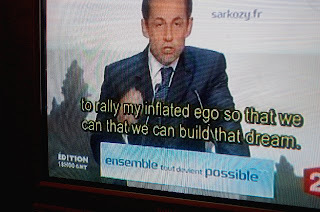 He will be up against Sarko - who seems to have an even more aggressive stance on the CAP than Chirac. The two things are certainly linked - the FCO will be telling Brown that he won't get anywhere on trade etc... unless he plays nice on the mini-constitution. We think that approach has been tested to destruction - but has Gordon learned that lesson? The Government's Energy White Paper mentions Europe or the EU a total of 512 times. That reflects the fact Government is making a hell of a big bet on the EU as the vehicle for its green ambitions. But is an organisation that has spent 45 years tinkering with the CAP really well place to lead an urgent campaign to "save the planet"? There is definitely a tension between the government's rhetoric about the "urgency" of climate change as an issue, and their seemingly unflagging (?) support for doing things through the EU, which moves at a snail's pace. The pro-euro camp have come up with their case for the new mini-constitution. It's a joint publication of the Centre for European Reform and "Business for new Europe" - a ludicrous front group set 'inspired' by Peter Mandelson, which operates out of the offices of a lobbying firm called Finsbury. Its a very amusing read. After a good deal of beating about the bush, it tries to make the case for the new text. One arguement is that the mini-Constitution is needed for enlargement. Eh? Didn't Sarkozy just say that Turkey is never coming in? As his aide Alain Lamassoure put it: "EU leaders have been lying to Turks for the past few years and the new French leadership believes we must stop doing so… The sooner we will have the courage to say this openly to Turkey the better." We don't mean to be harsh but has there ever been, at any point, any suggestion whatsoever from France that they might let in Turkey if we sign up to the mini-Constitution? Or is this 100% pure self-delusion? Another old argument is then dredged up. If we say no there will be "a loss of British influence". In fact "The Germans would not be amused that Britain had effectively destroyed what they hoped would be the crowning achievement of their EU presidency" (ooh - nasty). Its difficult to know where to start with this sort of defeatist argument. One basic point is that we have already tried making sacrifices to look communautaire. Where has it got us? Take the EU budget negotiations - we gave away over £7 billion pounds for nothing but the promise of a "review" later. The reality is that we need to have our own vision and insist on it. If your first priority is never to have an argument then you will never get anywhere. Another argument is that if we said 'no' then "The more integrationist countries would start talking about ‘variable geometry." A flexible Europe (multi-speed is the wrong word because it implies everyone is going in the same direction) is the only way out of the EU's fundamental dilemma: some member states want more integration, other want less. Lastly and leastly, the supposedly 'clinching' argument for the mini-Constitution is that the Union would become less capable of dealing with the many external challenges it faces". The paper lists Doha, the middle east, and Kyoto 2 as examples. But the EU has flunked every one of these challenges. It is the main obstacle to a real development round. During the hostage crisis, EU members refused to endorse even the most mild sanctions on Iran (like no more export credits). And the EU's resposne to climate change is a joke: EU Emissions are up, not down, since it signed Kyoto, and the EU's Emissions Trading Scheme is a catastrophic failure which as squandered a fortune while allowing emissions to rise. If we are ever going to get the EU to take these things seriously, the last thing we should do is legitimise the current EU's failings by giving it more power. The answer instead is to make our continued £10.5 billion a year payments to the EU conditional on progress - for example a meaningful Doha offer. The bottom line, and the fundamental difference in our approach, is that we believe you don't get what you want in Europe by just going with the flow. Over the last ten years (maybe even the last 35) we have tested that idea to pretty much destruction. Now we need a fresh start, not more of the same. The Europa website has a database listing all the international agreements and treaties to which the EC is party. There are about 656 of them - everything from the Kyoto protocol to the thrilling "Agreement in the form of an Exchange of Letters between the European Community and the Republic of Moldova establishing a double-checking system without quantitative limits in respect of certain steel products from the Republic of Moldova to the European Community." Nearly 8,000 Bulgarians and Romanians came to work in Britain in the first three months after their countries joined the EU, the Home Office said today. A further 2,400 have joined the seasonal agricultural workers' scheme. The figures did not provide a full picture of the numbers who have moved to the UK because no such records are kept by the Government. The Government had initially said that the number of jobs for migrants from the A2 would be 20,000. The Home Office said that "Low-skilled migration from Bulgaria and Romania will be restricted to those sectors of the economy where the UK already has low-skilled schemes and will be subject to a strict quota which will not exceed 20,000 workers per year." But later, after a run in with farmers, the Government reduced the cap to just 10,000. (See the Sunday Times and our blog from last October). But now it looks like we are already over that - with nine months to go. Whether the "limit" was 10,000 or 20,000, it looks like the fantasy idea of "limiting" the number of jobs available without limiting free movement is about to collide with reality. President Sarkozy has unveiled his new government today. In what may be a sign of things to come, he has given the only Socialist member of the 15-strong cabinet, Bernard Kouchner, the role of Minister for Foreign and European Affairs. The new Prime Minister, François Fillon, will also be assisted by a Secretary of State for European Affairs, namely Jean-Pierre Jouyet, the ex-head of cabinet of Prime Minister Lionel Jospin, and, reportedly, a close friend of both Ségolène Royal and Socialist Party leader François Hollande. - In October 2005 La Croix reported that Bernard Kouchner’s priority was to re-launch Europe with simple projects and concrete proposals so that it is no longer, in his words, “This cold and disembodied monster” alienated from its citizens. “Why have we not yet created a European fleet of water bombers to fight against forest fires? Universal medical cover at European level? Let’s stop debating and start doing things together,” he said (4 Oct). As a doctor and former health minister, he once called for a global fund against infectious diseases. "My right honourable friend the Prime Minister will lead the UK delegation at the European Council meeting on 22 and 23 June. The delegation will include my right honourable friend the Foreign Secretary". Blair's insistence that it will be him - not Brown - that will sign the deal on the new EU treaty is giving the Treasury jitters. According to the Mail Ed Balls a Brownite ally said,“We aren't being told what they are up to. It is very secretive. Our worry is that in an attempt to pull off a coup they will give away too much and damage Gordon". But the PM's not for turning. His spokesman said this morning that Blair would represent both the country and the Government at the EU summit, and that the Government's position in Brussels would be based on normal discussions with ministers - including Mr Brown - ahead of the talks. "He has been heavily involved in preparations for that EU summit and therefore it makes entire sense for him to be the one there. There are major issues still to be finalised within the coming period and that's what the Prime Minister will do." In a press conference today EU Transport Commissioner Jacques Barrot was asked repeatedly why taxpayers are now being asked to fork out for the new Galileo system when private industry groups have decided it’s not worth the risk. On the funding, he confirmed that the costs at this initial financing stage are €3.4billion, of which we already have €1bn, so €2.4bn more is needed. Add to that the maintenance costs once the system is built - €200m a year over a 20 year period - plus replacement of certain satellites, gives €10bn as a general amount. There were also a lot of questions about possible military uses for Galileo, to which Barrot replied, “Obviously there are civilian and military uses for this, but Galileo will remain a civilian system under civilian control, as the Council has reiterated time and time again. But that doesn’t mean that military users cannot use it, as long as they comply with certain principles. For example, we cannot stop the Italian Carabinieri or the Guarda Civil using Galileo to carry out their work, e.g. on search and rescue – these are military users.” He said Galileo “obviously cannot be off-limits to someone because they’re members of the military.” However he said he had no ‘mandate’ for discussing its military uses, saying he had tried to have conversations in London with ministers on this but lacked the necessary "mandate" for providing answers. He summed up saying industry was “chomping at the bit” for Galileo, and that Europe must not wait, or it will fall further behind. Instead of wasting time asking “metaphysical” questions about its military uses etc, we should be seizing "Europe's chance to stay at the top of the league." PS nice summary of sentiments here : "According to the European Commission website, Galileo will be "fully operable in 2008 at the latest, with start of signal transmission in 2005." Let's hope the software is more up to date than the web page - If we're all going to be reamed for the cost of this unnecessary waste of cash - and we are - it would be nice if the ****ing thing works." PPS - there's now a longer note on this whole issue on our website. Mrs Merkel is keen to hammer out a deal on the treaty aimed at modernising the structures of the EU before next month's summit in Brussels. Mr Sarkozy has said he wants a simplified EU treaty to be ratified as quickly as possible by the French parliament. So its going to be "modernising" and "simplifying" - exactly the UK Government line. Words we are bound to hear more of: "Greenplating". Yvette Cooper just said it in parliament. The Government is introducing Home Information Packs which go beyond the EU's requirement for Energy Performance Certificates. However she claimed: "Its not gold plating, its greenplating." Uuuuugh. Actually its not "greenplating" - its just idiotic. As we point out in a study today- if we we spent the money the Government is planning to flush down down the bog on "home energy surveys" on real green policies instead, then we could save 12 million tonnes of CO2 a year. What's wrong with the EU? Really interesting book coming out from Simon Hix at the LSE. Under the rules agreed at the Seville European Council, debates in the Council are open to the public at two stages of the co-decision procedure: (1) during the initial stage, when the Commission presents its initial proposal and in the ensuing debate between the governments; and (2) during the final stage, when the public can see the final vote in the Council on a bill and hear the explanations of how each government votes. The Council advertises which sessions are open and at what times on its website. However, Council debates are not open during the first reading of legislation under the co-decision procedure, after the initial debate on the Commission’s proposal, which is when the governments get down to the serious business of agreeing a ‘common position’ on the legislation. Deliberations are not open during the second reading of legislation, when the Council considers the amendments proposed by the European Parliament, nor at third reading, when the Council discusses whether to accept or reject a ‘joint text’ they have agreed with the European Parliament in the conciliation committee (which meets if the European Parliament and Council still disagree after two readings in each institution). And, debates are not open at any stage of the consultation procedure, which is still used for almost half of all EU legislation. Hence, despite the recent changes, the Council is still probably the most secretive legislative chamber anywhere in the democratic world. One could even go as far as saying that the legislative process in the Chinese National People’s Congress is more transparent than the legislative process in the EU Council! The problem is that as people learn more about the EU, they start to understand that economic integration benefits some social groups more than others, that they pay significant amounts into the EU budget and do not see much in return, and that it is almost impossible for them to change the direction of EU policies. "Car giant Nissan has announced a deal with a developer which will see the creation of up to 4,000 jobs in Sunderland. The manufacturer will build a GBP4.5m extension to its Wearside plant, while property developers Wilton and Clugston will create a business park on another part of the Nissan site." "The Sunderland factory has been Europe's most productive car plant for the past eight years". Surprise surprise, EU-funded "citizen consultation" finds that the EU should have more powers. What a total waste of everyone's time. No real people will feel that the EU is more "in touch" as a result of this. He gave a short speech which was followed by an German oompha band. Even by Mandelsonian standards it was an unusual (and unusually arch) speech. In between telling us that he was only there because he had been unexpectely "dumped" down in the UK, and informing the crowd that he would shortly be off for a hot bath (thanks for sharing) he went out of his way to praise David Cameron. He said that he had made the "best case for Europe" that he had heard in his recent Sunday Telegraph article. The speccie's diary of a notting hill nobody also picks up on the Cameron-Mandelson love in, suggesting that "our Man in Brussels" had been helping out with anti-Brown attack lines. Mandelson also noted that he "couldn't remember exactly when it was" that the Commission had collectively decided to allow dual metric / imperial measurements (as announced by Gunther Verhuegen in the European Parliament) by said he was confident that the "paper process would catch up eventually". "The Joan Ryan Club, a small but exclusive band of obsessives, will appreciate the following. There are some low minds who question the use of Ms Ryan. I've done so myself, I fear, in years gone by. But she is an essential figure in government. She is a sandbag. When a grenade is lobbed into the government trench she throws herself over it. Or maybe she gets thrown on to it. That is her talent. She is a blast-absorber." The reason he returns to taunt Ryan is that the European Scrutiny Committee has just released a new report which is highly critical of her decision to agree to new EU legislation even though the Committee had not yet approved it and was still holding it under scrutiny reserve. "When we talk about "agreement on the text", that is in the common usage of the word "agreement". It is not in relation to political agreement as a definition of a final decision subject to the linguist lawyers at the European Union. Perhaps I can say that maybe usage of the word "agreement" has caused some confusion, and certainly, if that is the case, I would apologise for that and it is regrettable and that is one of things I will take back. When I mentioned issues such as working with the officials and staff training and trying to better monitor the match between our process here and our process in the EU, that is precisely one of the issues I will feed in." "It is the case when you reach a general approach that one would expect substantive issues to be agreed upon around the Council table, or I think it would be very difficult to be able to reach a general approach. So if as a government we were not satisfied in relation to the issues within the proposal, if others round the table were very dissatisfied, then I think it would be difficult to reach a general approach, and I think that was the case in December. But is still remains the fact that when you reach a general approach, although there probably is agreement around the table on substantive issues, it is still subject to scrutiny reserve, the issue can still be reopened, and there are examples where in fact this has happened. There are not many, I agree. The reason there are not many is that the likelihood is substantive issues are agreed upon, or there is general agreement in the common usage of the word "agreement", before a general approach would be reached at a Council." Johan Norberg has some great stats on globalisation, prompted by the news that the number of people in extreme poverty has fallen below a billion for the first time. Not much to add to his list. Other nice facts: Every day 71,000 people in China log onto the internet for the first time; Edward Luce in his book on India mentions in passing that 60% of the world's buttons now come from one city in China; and if you are over 27, you are in the older half of the world's population. The Commission have put out a press release trying to make a big deal out of their planned 2008 budget. For the first time, spending on growth and employment policies will represent the highest share of the budget, ahead of agriculture and natural resources. This is the key message sent by the Commission in its budget proposals for 2008, adopted today. If you still aren't convinced, there's even a pie chart showing that competitiveness now accounts for 44.2% of the budget (the 43.6% on farm spending is sliced in two to look smaller). However, there are a number of small problems. One quibble is that the part of the so called "structural funds" budget (which sounds like it should be all about building roads) go on agriculture and fishing spending anyway. This 'hidden' agiculture spending appears to be increasing - it was up from 2.5% of the budget in 2002 to 4.2% in 2005, neatly tipping the balance from green to blue above. It will be interesting to see what has happened to it when the detail of the new 2008 budget comes out. Its also worth remembering that the total agricultural spend has gone up from €40.6 billion in 1997 to €56.3 billion now - so it's not like the spending has been slashed. Secondly, and more importantly, does the budget for spending on "employment and growth" actually create employment and growth? Quite apart from the general question about whether what Europe needs now is yet more government spending, the EU's budget for "competitiveness and cohesion" is really just a rebranded way of talking about the old "structural" and "social" funds. Is this money well spent? In the UK ,for example, it funds projects like designs for a plan to turn Barnsley into a "Tuscan Hill Village", or create a giant lake in the middle of Bradford. Elsewhere it leaves a slew of barely used motorways to remote areas, while in the richer member states it seems to lead to the building of a lot of community centres. Part of it goes on the ludicrous "interreg" programme which provides local councillors with nice jollies to other member states and things like the trans-manche assembly.